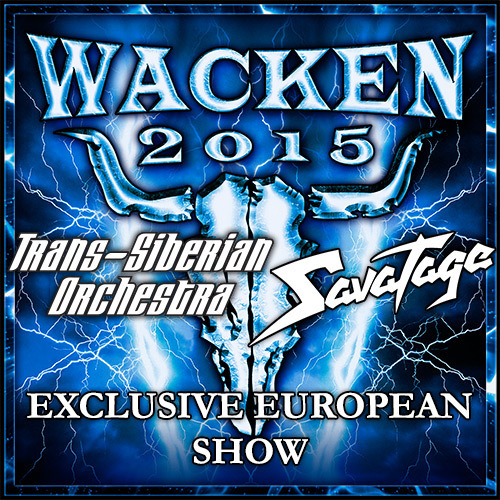 We're excited to announce that TSO and Savatage will be performing a special joint set at Wacken Open Air 2015! This will be the only live shows in Europe in 2015! Click here or read below for the update from the Wacken website. In 1986, introduced to each other by executives at Atlantic Records, two special men met for the very first time. The actually unlikely pair hit it off and, from then on, formed a team that would eventually write and release album classics like "Hall Of The Mountain King“, "Streets“, and "Dead Winter Dead“. The constant strive to push the boundaries of rock and metal evolved into the formation of the band Savatage, that soon was considered to be the world's first progressive metal band. Beyond that, it was the duo's vision, to raise the dynamics of progressive rock to a new level. By taking the best from the two worlds of rock and classical music and putting it together with multiple singers they were able to act without any musical limits - Trans-Siberian Orchestra was born. The two said men, that created all of this, will be with us next year. Paul O'Neill and Jon Oliva together on one stage – and here in Wacken, they will show us their past, their present and their future. Trans-Siberian Orchestra will be performing live on stage at Wacken 2015, followed immediately by a Savatage reunion gig, that also marks their first live performance in over a decade. Furthermore, these will be the only live appearances of both bands in Europe in 2015!